Hi! 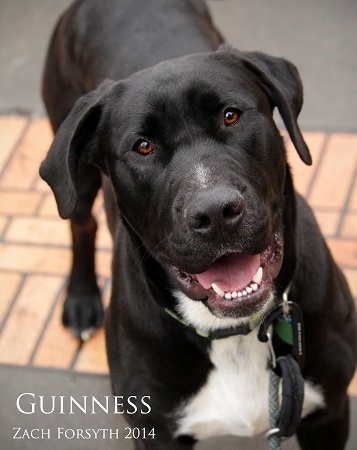 I’m Guinness! YEP! That’s my name. Guinness! I’m 89 pounds, and I’m only 1. I’m a big, awesome, exuberant, active, rambunctious, SWEET guy. SOME people have compared me to Baby Huey. You know, the big clumsy duck from the 1950’s. What the heck?! While I don’t necessarily agree with them, I guess you could draw a few parallels. Like Baby Huey, I don’t know my size. Because I’m only 1, I consider myself a baby, but my little Pomeranian and Chihuahua friends tell me that I’m bigger than they are. Frankly, I just don’t see it. And like Baby Huey, I love everyone’¦Huey, Dewey, Louie, cats, other dogs, kids’¦although I might not be all that good around kids under 6. Did I mention that I don’t know my size? I wouldn’t intentionally harm a little kid, but SOME people think I might knock youngsters right down. I read somewhere (yes, of course I can read) that President Bill Clinton said “I’m a lot like Baby Huey. I’m fat. I’m ugly. But if you push me down, I keep coming back.” So, I totally take issue with being compared with being fat and ugly ’cause i am SO handsome and in perfect, tip-top shape! But I think that there just might be another parallel in that when you tell me to get down, I keep jumping up. So, puppy classes are mandatory if you want to adopt me. And I really don’t think that President Clinton or Baby Huey are fat or ugly. I’m vaccinated, microchipped and neutered. My adoption fee is 250. Fill out an application at pixieproject.org so w we can schedule a meet and greet!